I'm happy to say that my new book, A Dad’s Work is Never Clear: Tales of Love, Marriage, Parenting and Ice Cream. Lots of Ice Cream., is now also available on Barnes & Noble and at your local Barnes & Noble (if you ask them to order it). Also, "they" have always said that laughter is the best medicine. 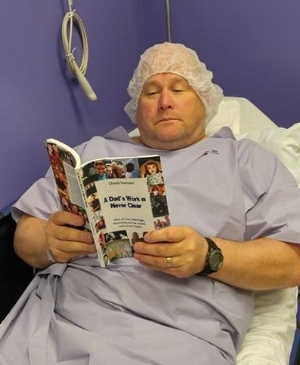 Well, this book is so funny, doctor's are now prescribing it in the place of general anesthesia, as you can see by the actual, not fake photo on the right. That is former Virginia Tech Hokie starting center and current fashion model Mark Johnson getting prepped to go under the knife. Or maybe it's because the book is numbing? In any case, there's your proof. Mental Health: Ten percent of the profits from A Dad’s Work is Never Clear will go to non-profit organizations that address mental health. For more information or to get help, contact the National Alliance on Mental Illness at www.nami.org. Or, locally, contact your local government Mental Health Support Services Community Services Board.